As a silage blade, this versatile attachment is useful for feeding housed livestock which avoids the need for graping silage. It is spring loaded and easily angled, equipped with a 2 sided rubber blade to protect the floor from damage. This blade can also be used as a dozer blade to help level out soil or for other tasks around the yard or garden. Quad-X have developed the strongest most versatile front mount systems you can buy. It fixes to the underside of almost all ATVs and does not affect your ground clearance. It can be used with numerous Quad-X attachments such as the power sweeper and front bucket. Quick release clips allow easy attachment / removal of the front accessories in seconds. 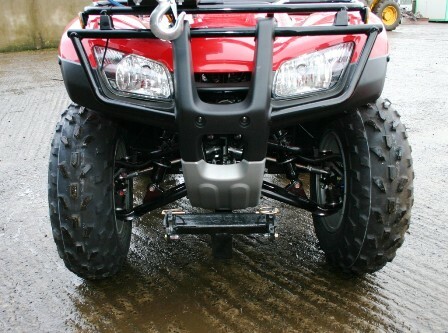 These front mount systems should fit onto any quad.